Who hasn't fantasized about flying! You can explore and enjoy this sport with total ease, as you fly in the legendary Challenger II (two-seater: pilot and passenger), known for its excellent flight performance, operational safety and extraordinary gliding capacity. Make it your first tri-dimensional adventure! This journey begins with a gentle ascension; you will slowly begin to feel that you blend in with the impressive landscape that appears before your eyes. A compelling force invites you to feel as light as the air you float upon. Marine Park and Mangrove Tour! This adventure begins with the Marine Park Tour. 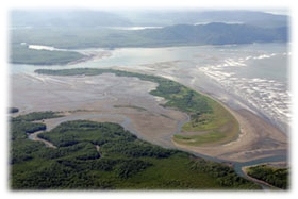 On this scenic route, you will explore Ballena National Marine Park, where the lush rainforest, extensive golden sands and the oceanic deep blue hues combine to form a visually perfect work of art, appreciated only in nature. We will fly gently south, toward an immense and undiscovered setting inhabited by an expansive mangrove forest. This unique forest is made up of peculiar trees of unrelated species with an incredible power of adaptation. The mangrove tree species have developed a certain tolerance for salt water, and their impressive aerial roots line the edges of the lagoons and estuaries. This valuable natural ecosystem is a habitat and breeding ground for a great variety of aquatic birds, in addition to myriad fish species and other marine organisms. 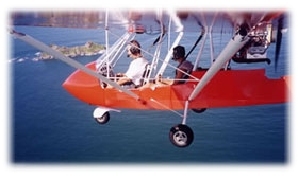 Now you can create your own eco-tourism flight, choosing where you'd like to be within our established flight radius, Drake Bay, Golfo Dulce, Corcovado National Park, Manual Antonio National Park, etc. Minimum of one hour.